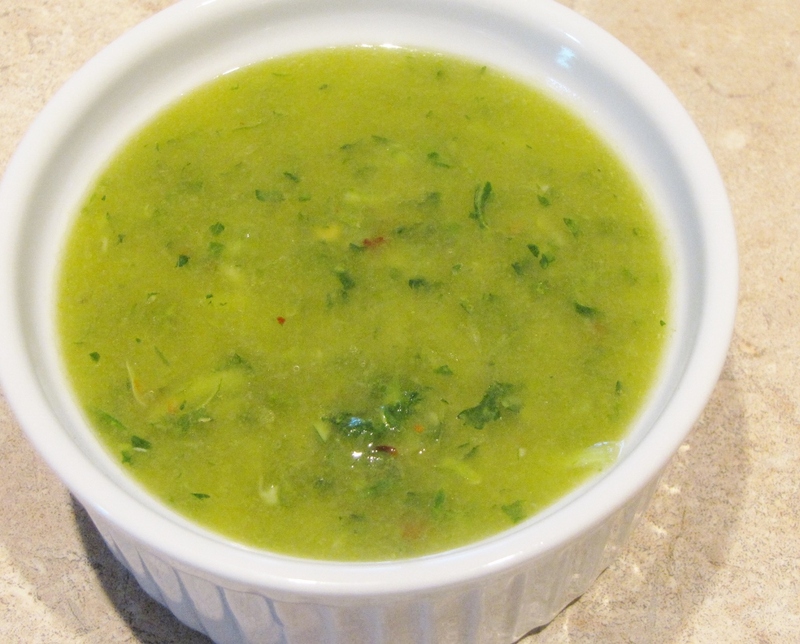 Chimichurri is an Argentinian sauce served with steak. 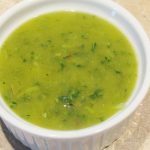 It’s typically made with parsley or mint, garlic, red pepper, olive oil and vinegar. It’s super simple to make and is an excellent accompaniment to grilled meat, especially beef. The plan? Grill up a skirt steak and serve with chimichurri. The challenge? No parsley or mint. On to Plan B, which is how most of my recipes come about. What I did have in the fridge that could work: garlic scapes, scallions, cilantro . . . yup, Plan B is going to work! Please note my, ahem, VERY EXACT measurements. 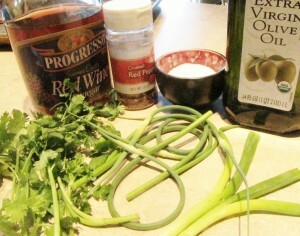 Place the cilantro, garlic scapes, scallions, salt and pepper in the processor. Process. Combine the olive oil and vinegar in a separate bowl and, with the processor running, slowly add the olive oil/vinegar mixture. That’s it! A few simple ingredients. Really. 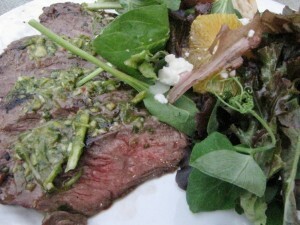 The chimichurri is best served at room temperature. We usually pour it right over the meat while it’s resting. This method allows the flavor to soak right into the warm meat. You can refrigerate any leftover chimichurri. Just bring it to room temperature before serving.